“This painting was inspired by the phrase ‘kissing the face of God,’ which I heard in a song many years ago,” said the artist. “I immediately thought of a composition with Mary and baby Jesus and how Mary had the privilege to hold God in the flesh in her arms. She cuddled and kissed him just as all mothers do with their babies. 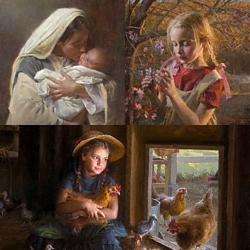 God chose to send his Son into this world in this amazing way — in pure humility.” "Kissing the Face of God" is one of Morgan Weistling’s iconic images, a portrait of light and love with universal appeal. This Greenwich Workshop Fine Art open edition canvas is available in two sizes so you can find that special place in your home to enjoy it.